On the bus ride from Calafate to Chalten I hovered just above my seat, nose pressed against the window. Just like the time when I first saw Tryfan, Mont Blanc and El Capitan there was that sense of eager anticipation, trying to glean every last detail out of the landscape before you. After two hours of nothing but baron featureless desert there came something, something dramatic. The almighty bulk of Fitzroy and it’s surrounding peaks, watching over the valley and keeping the gathering storm clouds at bay. All of a sudden we had been transported into a very different world, the wildness seemed so ripe it was ready to burst. Unbeknown to us, this was to be one of only a handful of days that we would actually see the mountains – such is the magic of Patagonia. One of the major appeals of climbing in Patagonia, as opposed to Nepal, is that there is a lot less hassle: no peak fees, no permits, no acclimatisation, no porters, and no pre-defined objectives. This sense of freedom was quite liberating and with the area having become more developed in recent years there is also a good number of sport climbs/boulders to keep yourself occupied when the weather in the mountains is bad. What more could you ask for? 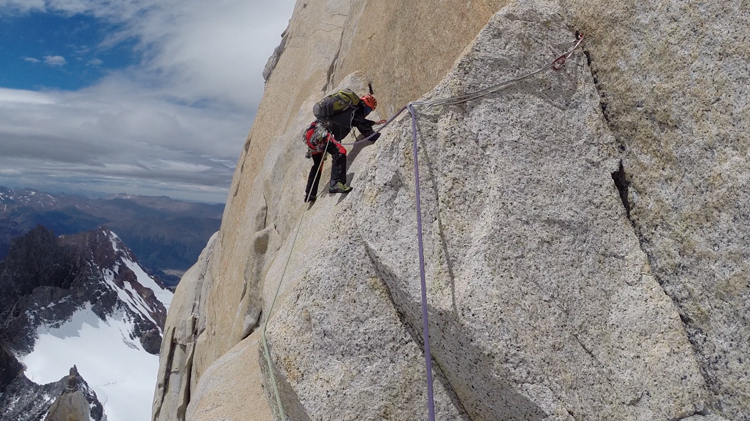 The development of Chalten has changed climbing in the region in more ways than one. Patagonia has gone from being a major expeditionary undertaking into a trip; like the Alps, but with far more unpredictable weather, longer walk-ins due to the lack of lift access, and (possibly the greatest factor of all) the absence of a helicopter rescue service. Just because of this change in convenience however doesn’t make it any less serious (as I will discuss later) and the feeling of adventure is still very much there. 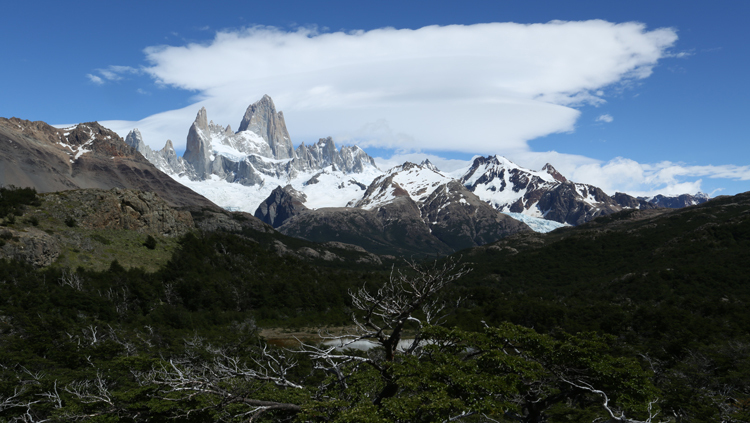 Our original objective had been to climb the Ragni Route on Cerro Torre, but upon arrival news of poor conditions and not a single success on the route so far led us to turn our eye over towards the Supercanalete on Fitzroy. This wasn’t too much of a disappointment as – just to repeat my statement from earlier – climbing anything in Patagonia was to be a blessing. It is best not to get too fixated on a single objective, particularly somewhere well renowned for fickle weather and conditions that vary radically from season to season. Come with many ideas, but very few firm plans – kind of like Scotland really. One week after our arrival the time came, we had our weather window. 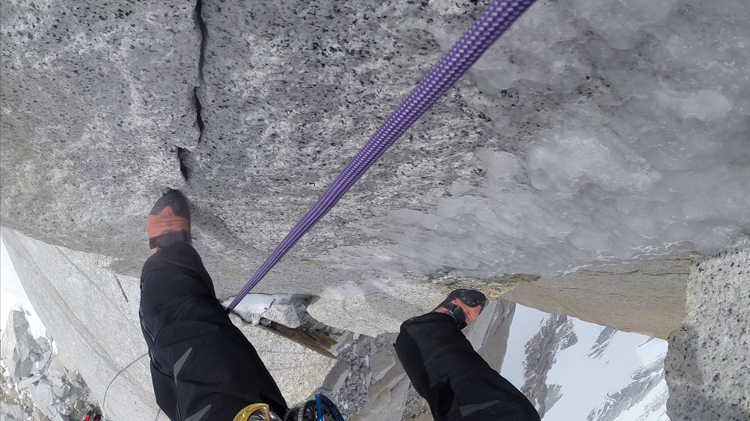 Just two days, but that was all that we needed to make an attempt on the route. Stupidly I had only packed a small 35 litre rucksack for the trip hoping that it would inspire me to go fast and light, in retrospect this was a poor decision as it made the walk-ins an absolute nightmare. Reading the guidebook again and again we had analysed our route, broke it down into sections and assessed our chances of success. We could do it, the route was ours. The clouds cleared and revealed a monstrous and barely recognizable figure – Fitzroy – but not as you see it in the guidebooks, not as we had planned. Covered in rime from top to toe our unshakable confidence was very firmly shaken. This was not the expected. There are multiple 5/5+ (HVS) pitches at the top of the Supercanalete and climbing these in Scottish Mixed conditions was not only going to be hard (probably nearer VI/VII) but it was going to be time consuming. The decision didn’t take long to make as our weather window was simple not large enough to embrace a route of this size in that condition. I didn’t see this as a negative, I had prepared for this – the only question was what to do instead. 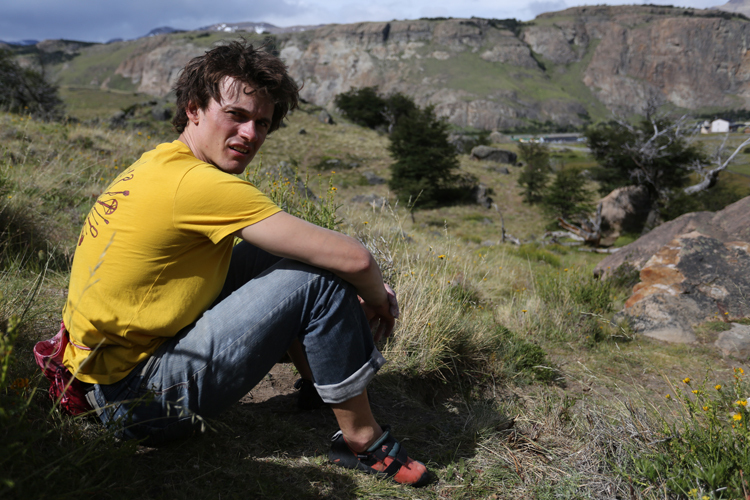 Jack was of the opinion that we should head further up the valley to inspect a new line off the Marconi Sur Glacier. I was of the opinion that we should continue as planned up to Piedro Negra and climb an easier objective on a neighboring peak, it was a very real concern that this could be the only opportunity we would get to climb something weather wise and we would be best using it by climbing a route. After a cup of coffee the decision was made: we would attempt the Comesana-Vonrouge on Agua Guillaumet, a classic of the region and ideal choice for our first route in Patagonia. I won’t go in to specifics about the route like when we started, or blow by blow accounts of moves, because quite frankly that’s boring. What I will say is that it was a privilege to be up there. The route was in rather entertaining conditions, with many of the cracks covered in ice and the temperatures well below zero. The best way of describing the rather peculiar style we adopted was like Scottish Winter climbing, but using your hands instead of axes and rock boots instead of crampons. Insane. I’ve always like ridiculous climbing and in between the agonising hot cramps (of which no human can relate to because mine are so much worse) it was hard not to laugh at what we were doing. Standing on the summit looking over towards the smoking summit of Fitzroy, then on towards the endless Patagonian ice-cap was a moment to remember. Filming the route only added to the experience. Matt Pycroft had gone out of his way to impart all the film-making knowledge possible during the days of bad weather so that when the time came we could get the best footage possible. You only get the chance once and often it is the moments when you least wish to film that make the best viewing. The footage, which will be released as part of a six part series for Epic TV, will be released in the Spring – I am proud to have played a part in it’s creation and I look forward to seeing the final edit myself. Thanks to both Matt and Jack for involving me within this project and also to Marmot and DMM for the support. On a sobering note, our return was greeted with the bad news – there had been a accident on the Supercanalete. A team from Sweden had been moving together up the initial gully when one slipped, the resulting fall pulled them off the route and back down the gully. Fortunately they had carried a Sat-Phone and another team on the route had managed to call the local rescue team. By the time we arrived it was 20:00. Unlike the Himalayas there is no option of helicopter rescue in Patagonia, in many ways making it a much more serious proposition. All rescues need to be mounted from Chalten, which from the base of the Supercanalete is a 5-6 hour walk. It is times like this when something truly inspirational occurs and that night the effort of the rescue team – comprised mainly of volunteer from the local community – and the climbers at Piedro Negra was something to behold. If that was me I know how much I would appreciate any help given, so we gave it our all. I am so glad that they got back to town alive. It cannot have been a nice experience for either of them, the help we offered was the least we could do. Thank-you to all those involved. From this point on I can’t really say a great deal about the rest of the trip, being that it was thwarted by fairly unrelenting bad weather. I used much of my spare time to read, stretch, drink coffee and relax – it was Christmas after all. Patagonia is definitely somewhere I’d like to go back to. 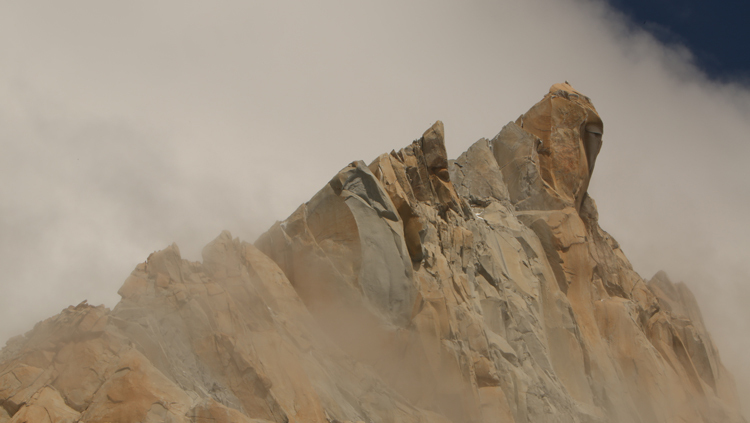 Cerro Torre and Fitzroy are two of the most aesthetic peaks I have seen and are reason enough to return, but then again so are Poincenot, Saint-Exupery, Demiluna, El Mojo – the list goes keeps on going. Here’s to a fantastic 2014. Hi Rob. Enjoyed your account. I spent 6 seasons between 1979 and 1988 on 2 or 4 man expeditions a bit further S in the Cordillera Darwin of Tierra del Fuego, attempting the then unclimbed Pico Roncagli and experienced very similar conditions. 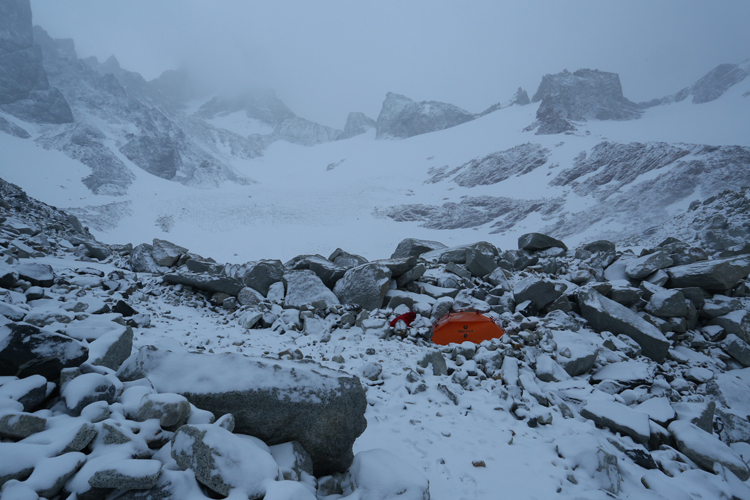 On one occasion 4 of us were crammed into 2 man tent for 10 days, luckily in the lee of a rognon, but the sight of sizeable boulders being blown across the glacier beyond was quite sobering! But the far South is magical – even the weather – and gets into your soul, especially the glorious stillness when the wind finally does stop. The Cordillera is even more isolated than Fitzroy. It’s 2 days down to the coast and the nearest sizeable centre of population is 60 miles down the Beagle Channel to the Chilean naval base at Puerto Williams. One other trip was to the unexplored Santa Ines island further North. On that one we were reliant on the Chilean Navy to get us there and pick us up 6 weeks later. No radios or satellite phones, real castaway stuff, especially when after I succumbed to a strange lurgy and we came down off the icecap and realised we’d inadvertently already eaten our reserve food! A week of surviving on mussels and calafate berries was interesting. Hope you get to return soon. Rob and Iain I was on one of those expeditions to Roncagli perhaps the best place to climb in the world!!. Rob Good luck with all your future expeditions. That sounds incredible Iain – proper adventure. Just noticed your report in the Climber’s Club Journal, it makes for a great read (http://www.climbers-club.co.uk/journal/original/2006-07-Journal-p103-109.pdf). I assume the Rowland in question was Rowland Edwards? Hope all is well down South, I’ll be down as soon as the North thaws out and the sea cliffs are dry (which they probably are now anyway!). No, I was with Rowland Perriment, one of SW climbing’s great characters who put up some fine routes at Carn Gowla in the 70s, such as the popular Journey to Ixtlan and Aprez Vous. 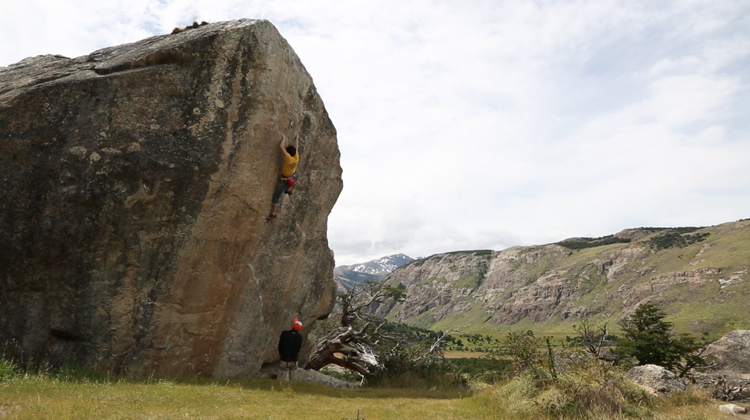 Rowland had spent the previous summer climbing in the Valley, including a first British ascent of Tangerine Trip, then worked illegally on the oil rigs before we met up in Miami for the trip down South. He spent a week living under a windbag at Miami airport because I had my rucsac with passport and money for the trip nicked in an Okehampton launderette just before I was due to fly out! Sadly, Rowland died suddenly a year or two back as a result of an undiagnosed heart condition. Paul Buttrick and I were also Culm Coast addicts and climbed together regularly both locally and in the Alps. We had some great times together and fortunately have now got back in touch again. Yeah, get yourself down here soon, before all the best crags fall into the sea! Don’t you just love spellcheck. That should read Winebago!